Exciting figures are packaged with a piece of a droid that you build! Characters span the entire Star Wars saga! Be a part of the legacy! With dozens of movies, countless comics, and an entire library's worth of books and games, the Star Wars galaxy continues to expand! The Legacy Collection brings back some old favorites as well as some new faces, bringing the fun back in a whole new way. 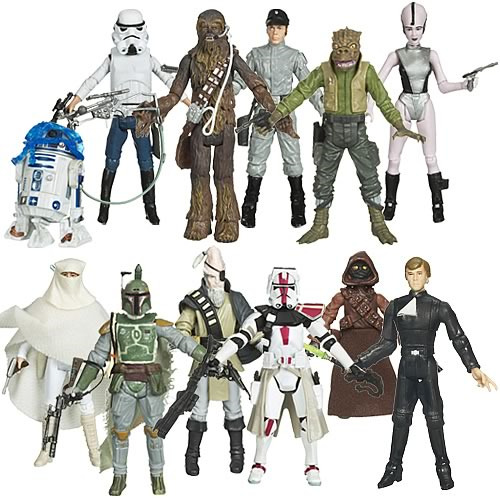 These 3 3/4-inch scale plastic action figures each include accessories and feature tremendous detail, and you'll find such distinguishing touches as articulated wrists, removable helmets, and much more.